In Forbidden Historywriter and editor J. Douglas Kenyon has chosen 42 essays that have appeared in the bimonthly journal Atlantis Risingto provide readers with an overview of the core positions of key thinkers in the field of ancient mysteries and alternative history. The 17 contributors include among others, Rand Flem-Ath, Frank Joseph, Christopher Dunn, and Will Hart, all of whom challenge the scientific establishment to reexamine its underlying premises in understanding ancient civilizations and open up to the possibility of meaningful debate around alternative theories of humanity's true past. Each of the essays builds upon the work of the other contributors. Kenyon has carefully crafted his vision and selected writings in six areas: Darwinism Under Fire, Earth Changes--Sudden or Gradual, Civilization's Greater Antiquity, Ancestors from Space, Ancient High Tech, and The Search for Lost Origins. He explores the most current ideas in the Atlantis debate, the origins of the Pyramids, and many other controversial themes. 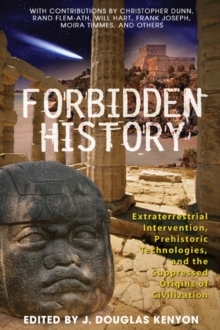 The book serves as an excellent introduction to hitherto suppressed and alternative accounts of history as contributors raise questions about the origins of civilization and humanity, catastrophism, and ancient technology. The collection also includes several articles that introduce, compare, contrast, and complement the theories of other notable authors in these fields, such as Zecharia Sitchin, Paul LaViolette, John Michell, and John Anthony West.